This picture was taken in July, 2009 while I was standing in the doorway of our house. I love watching storms and clouds but maintain a healthy respect for the power of Mother Nature. This storm was moving so quickly and making the sky so dark that my 30 second photo session required multiple camera adjustments. I wasn’t going to venture far from my house with that nasty storm–that is for sure! I’m so looking forward to storm season. 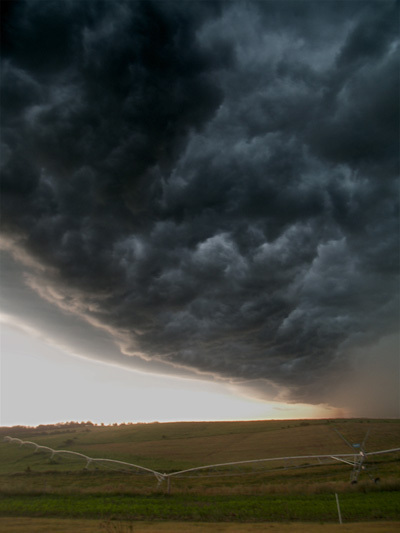 I love a good Midwest Nebraska storm, I too have a great deal of respect for them. But like many who have lived here so long you learn how to read the clouds and becoming a “storm spotter” of sorts. Yes, it is amazing how quickly a person can develop that “sixth sense” about storms–which ones are serious and which ones aren’t. magnificent. I’m 98% glad I’m not there. This storm was to the south of us, we actually did not get much rain. I would not have wanted to be in its path–that is for sure!